SLOW COOKER PEANUT BUTTER CHOCOLATE SWIRL CAKE — If you love peanut butter and chocolate, you’re going to love this warm, gooey slow cooker cake that combines both flavors in one decadent dessert. I have a couple of huge peanut butter and chocolate fans around here (myself included) and this Slow Cooker Peanut Butter Chocolate Swirl Cake was a big hit with everyone! It starts with a boxed yellow cake mix, which makes it a quick and easy recipe to throw together. I’ll take a good shortcut in the kitchen any time! 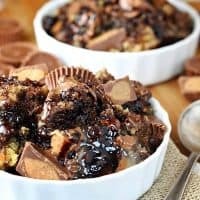 Add some peanut butter, chocolate syrup and miniature peanut butter cups and you have a warm, comforting cake that’s the perfect ending to almost any meal. And making it in the slow cooker means it comes out moist and gooey, just like a cake should be. 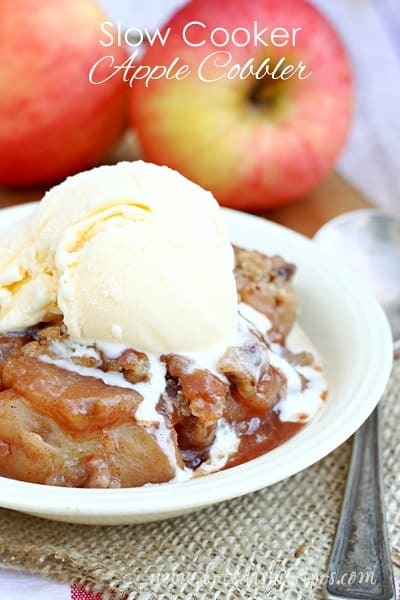 It also means it’s perfect served with a big scoop of vanilla ice cream! While the recipe specifically suggests an oval slow cooker, I think you might be able to get away with a smaller, round slow cooker. Don’t quote me on that though. But if you try it with good results, I’d love the hear about it. I also think you could easily sub chunky peanut butter for smooth, if that’s what you prefer. Like I said, a big scoop of ice cream is a must. And I highly recommend an extra drizzle of chocolate syrup and a few peanut butter cups for garnish too. 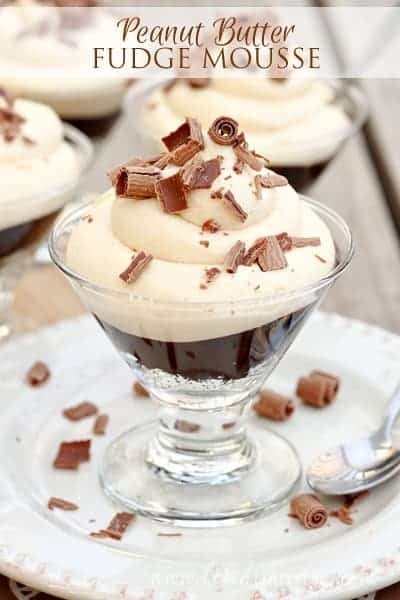 This is the perfect dessert for a lazy weekend. I hope you enjoy it as much as we did! Be sure to save this Slow Cooker Peanut Butter Chocolate Swirl Cake recipe to your favorite Pinterest board for later. 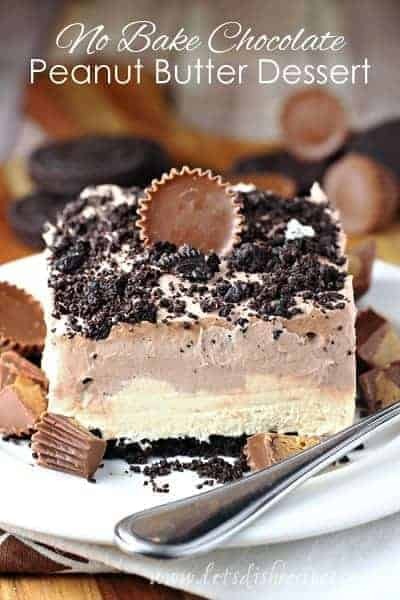 If you love peanut butter and chocolate, you're going to love this warm, gooey slow cooker cake that combines both flavors in one decadent dessert. Lightly grease a 6-quart oval slow cooker. With an electric mixer, beat cake mix, water, eggs, 1/2 cup peanut butter and butter on medium speed for 2-3 minutes, or until smooth. 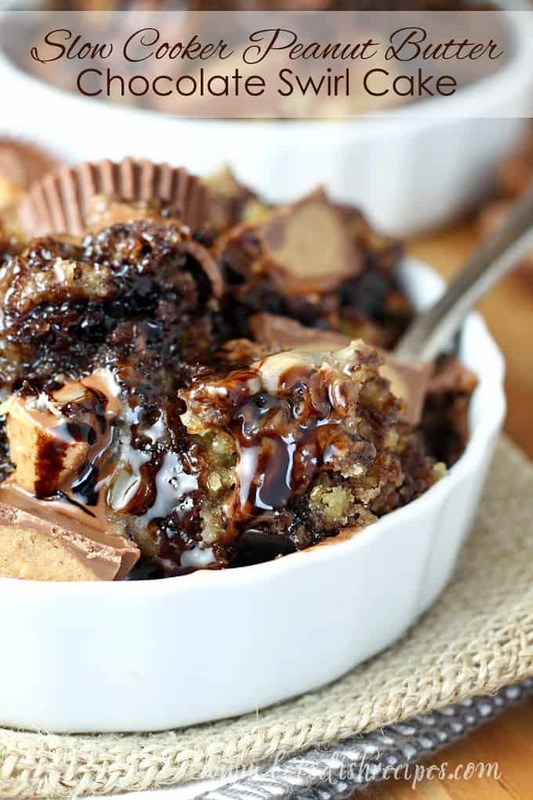 Remove 2/3 cup of batter to a medium bowl and stir in 1/2 cup chocolate syrup. Spoon 1/2 of the peanut butter batter into the slow cooker, followed by all of the chocolate batter. Top with remaining peanut butter batter and swirl batters together with a knife. Cover and cook on high heat for about 2 hours (check at 1 hour 45 minutes) or until toothpick inserted in center of cake comes out mostly clean. Turn off slow cooker, uncover, and let stand 10-15 minutes more. Meanwhile, whisk together 3 tablespoons peanut butter and 2 tablespoons milk until smooth. And powdered sugar and mix until smooth. Add additional milk as needed, until glaze reaches desired consistency. Spread peanut butter glaze over warm cake in slow cooker. 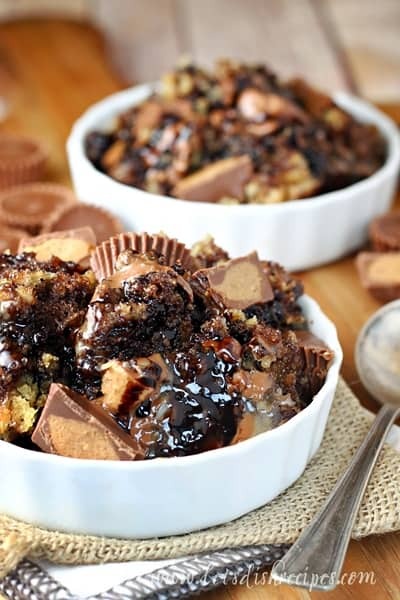 Drizzle with chocolate syrup and sprinkle with miniature peanut butter cups. Serve warm with ice cream, if desired.